Playland offers many ways for campers to discover new interests, expand on their talents and use their imagination. We have a variety of creative and performing arts activities. Our talented arts specialists are school teachers and professional artists dedicated to uncovering each camper’s creative potential. Our Arts & Crafts studio utilizes both indoor and outdoor spaces and features a large pottery kiln. 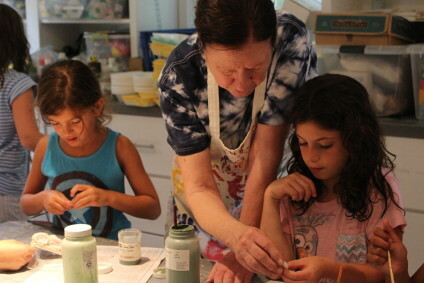 Playland campers use their imaginations as they experiment with many exciting mediums to bring out the artist within! Campers will explore the worlds of pottery, painting, lanyards and crafts, beading, tie-dying, and more. Music is all about discovery. Campers are exposed to drums, rhythms, xylophones, guitars, singing, music games and activities, knowledge of composers, and more. Dance & Drama takes place in the Playland theater and campers have the chance to act on stage, create and practice choreographed dances, have fun with improv and play many theater games. Playland’s energizing environment, skilled instructors, and wonderful facilities offer the perfect setting for campers to experience the arts.